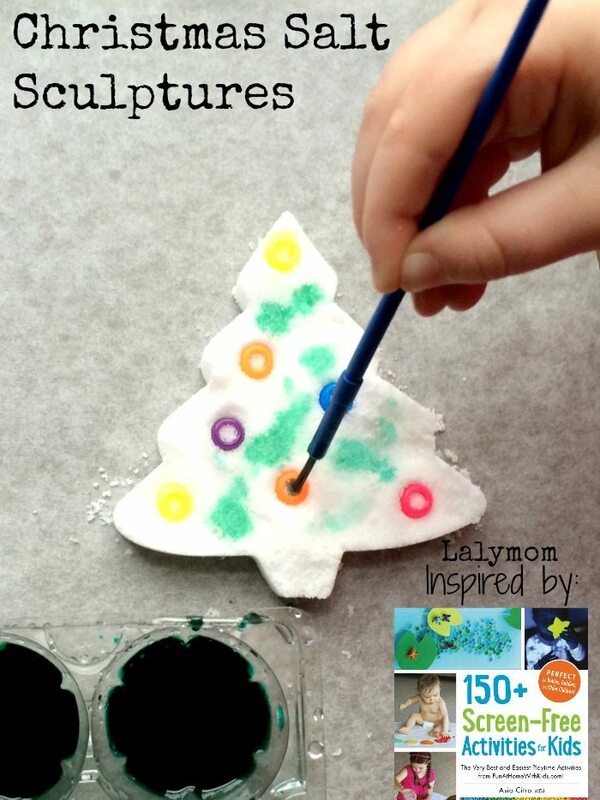 Today's Christmas Activities for kids are inspired by an AWESOME new book that I had a chance to review. Before I tell you all about it, I should mention affiliate links are used in this post, which just means that if you click through and buy something, I make a tiny commission at no additional cost to you! So. About this book. It's called 150+ Screen-Free Activities for Kids and it is by Asia Citro, the writer of one of my all time favorite blogs, Fun at Home with Kids. This is a review of the book from the point of view of a mom who does NOT usually engage in messy play. Short version: MY KIDS ARE SO LUCKY WE GOT THIS BOOK. If you are like me and are usually kind of averse to messy activities I highly recommend this book and I'll tell you why. There are ideas in here that I would usually shy away from, but it's OKAY. Asia includes a super helpful section on how to contain the mess and it really helped give me confidence to do something we might not have done otherwise. I also feel like any time we DO take the opportunity to engage in potentially-messy play, it is usually less messy than I anticipate and the sensory and play benefits far outweigh any modest amount of cleaning that I do. Did I mention my daughter is a bit mess-averse too? The photographs in the book are so inviting that she took one look and started picking activities that she wanted to do. Yes! A four-year old who doesn't like to eat saucy foods and who flings off anything stuck on her hands was asking for play recipes! Winning! True to the title, this book features screen-free activity ideas- tons of them! We used a recipe for Salt Sculptures from the Simple Sensory Play chapter but there are other chapters on Slimes, Doughs, Paints, Small World Play and DIY Toys. -It includes ideas that can be used with babies, toddlers, preschoolers and even bigger kids! -The index and activities are labeled for allergy information, whether or not it is taste-safe. -Each activity offers ideas to explore the ideas further with different variations. -Step-by-step instructions for each activity are clearly written. -Full color photos to show you what to expect. The thing that I loved the most in terms of is that my kids will really benefit from us having this book. Every single activity inspires hours of creative play. We chose one single activity from the book for this post and it turned into several more activities, all stemming from the first one! I love that! You can take any activity and do it right straight from the book and it will already be awesome- or you could put a holiday twist on it like we did below, or relate it to any number of books, themes or ideas. It opens up so many ideas for play! If you find one type of activity that your child likes, you can make it over and over again in different colors or related to a different theme. SO. Much. FUN! Want to see the fun that was inspired at our house? Check it out below! We chose to start with the Salt Sculptures activity on page 177 in the Simple Sensory Activities chapter. The recipe was simple and the instructions were easy to follow. 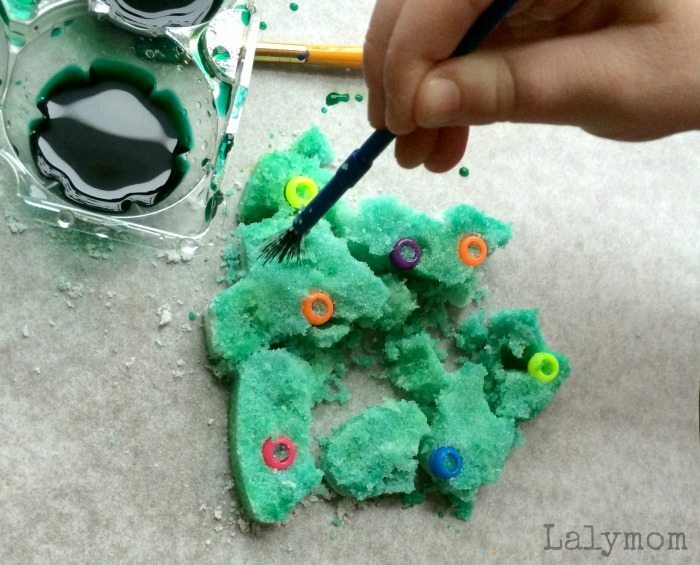 To put a Christmas spin on it we made our salt sculptures into Christmas trees using a cookie cutter. As we molded the trees we also did some trees with pony beads pressed into them to look like ornaments. In the book they use lots of different colors on their salt sculptures but we mostly used green. My daughter loved the idea of painting the salt sculptures and she loved to watch the paints seep into the salt. She loved it so much that we totally soaked the salt sculptures. We could have let them dry but my daughter loved the experience of smushing them- and I didn't stop her. I let her explore. Once she totally smushed them she started playing with the salt. It got on her fingers and she was totally okay with it! Win! Guess who else was okay with it- ME! Double win! Since then we have used the colored salt for lots of play ideas. Note: colored salt is also a featured recipe in the book, we just had the happy occasion of ending up with the colored salt after our initial activity! 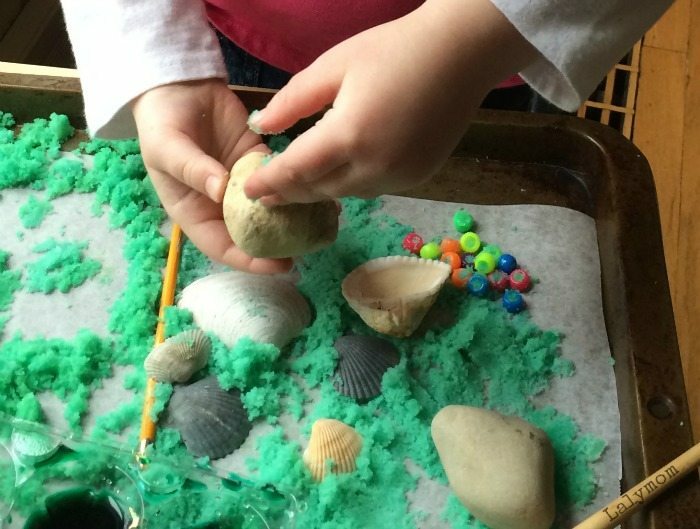 We used the salt for a Christmas Salt Tray with printable word cards, but my daughter also asked for seashells and used the sand to create a small world all by herself! Another time my daughter was in the mood to play Pirates so I hid some golden jingle bells in the sand and called them gold doubloons. She used our round-tipped tweezers to hunt for them and fish them out of the sand. We have the sand in a container right now and I am sure she will request to play with it again, it has been really fun to see her come up with ideas to use it too! 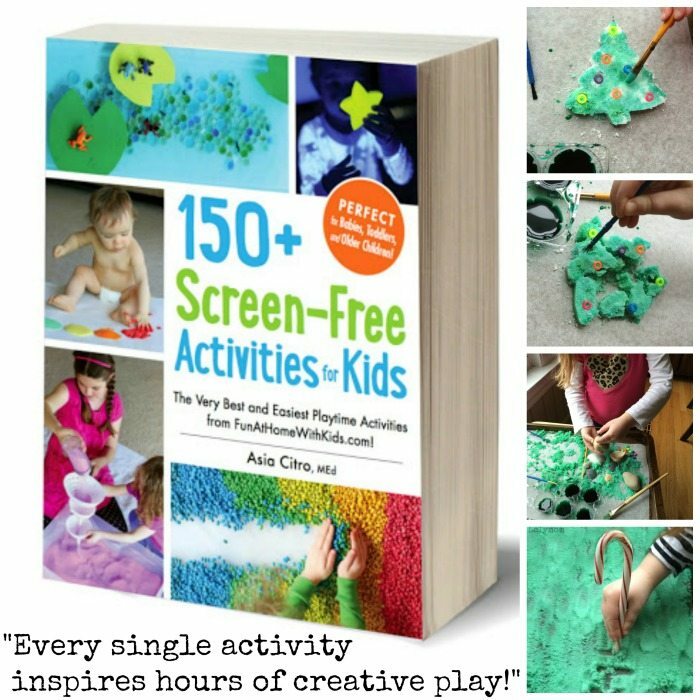 If this first activity is any indication, I know we will have so much fun inspired by 150+ Screen Free Activities for Kids and I hope you will buy a copy for your family or someone you love!